The 8th edition of Auto Summit has just ended; it was organized by FADA (Federation of Automobile Dealers Associations) at the Hotel Le Meridien in Nuova Delhi, India. The event takes place during the Auto Expo and it is attended by about 800 operators of the automotive sector coming from all over the world. 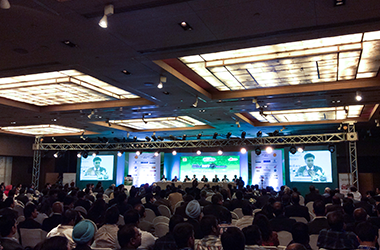 This edition was scheduled for February 7th and 8th the theme “AUTO RETAIL – SURVIVAL MANTRA”. Mr Praful Patel, Hon’ble Union Minister of Heavy Industries and Public Enterprises, Government of India, took part in the inauguration of the Summit, which was called “Light Ceremony”, as symbol of sharing, participation and growth. Gabriele Maramieri, COO of Quintegia, was honoured to be one of the speakers of the International Roundtable on February, 8th. During the Roundtable the representatives of the main foreign delegations discussed about the automotive scenario, trying to identify the best practices and regulations in the different local sectors. A lot of interesting ideas emerged during the 2 days. The Indian market has a great potential: it is supposed that it will reach about 10 million sales per year in the future, thanks to the planned investments and the support of the government which will work together with the bank system in order to reduce interest rates. By this way, they will facilitate the access to credit and give immediate spur to the market. Among the meetings, on February 7th took place an interesting Panel about the dealer satisfaction, with the participation of both FADA top management and managers of the main car makers.